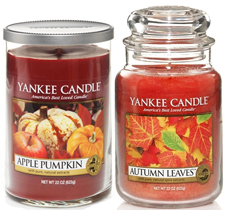 Today and tomorrow you can save $10 off your Yankee Candle purchase! There is no minimum purchase amount so with any purchase you'll save $10! This offer is only good for in store and it ends on Sunday November 15th. Click on the picture below to get your coupon! This is an amazing deal! I need to change my plans to get over there and stop dreaming about a Yankee candle and get one! I love Yankee Candles. This is a great deal. Thanks. Sweet deal. I really like Yankee Candles.